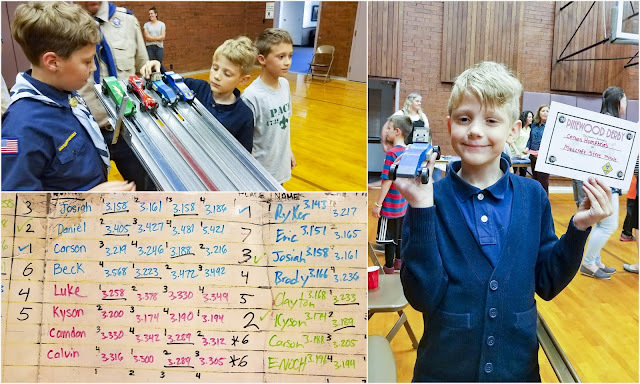 This was Carson's first Pinewood Derby. Todd has been researching hard and sharing with Carson tips to make their pinewood derby car fast. Carson chose a Steve from Minecraft design. They worked together to cut, sand, assemble and paint it. It took several evenings to get it together, but it turned out great in the end. As you can see from the scoreboard, it was also a pretty fast car. Our cub scout group combined with another troop for the race, doubling our number to close to 25 kids. Carson's car ranked 5th overall, and 1st in his cub scout rank category. Way to go team Carson and Todd!